after hitting a two-run homer against Irwin County on April 2. A pair of Georgia High School Association coaches will seek career milestone coaching victories this week. Saint-Anne Pacelli head coach Bobby Howard is one win shy of 1,000 victories. He is the state's all-time winningest baseball coach after guiding Columbus High School for more than two decades. He will become the only baseball coach in state history to record 1,000 or more victories. Howard is in his first year at Saint Anne-Pacelli. The Vikings will play host to Webster County on April 8. Longtime Pope baseball coach Jeff Rowland needs two more wins to reach the 500-win plateau. He would become the 29th coach in state history to reach 500 or more wins. The Greyhounds will play at North Atlanta on April 8, then play host to Northview on April 10 and Dunwoody on April 13. Jeff Davis head coach Paul Glass will be going for win No. 400 when his Yellow Jackets open a three-game set this week against Swainsboro. Jeff Davis will visit the Tigers on April 8. MILL CREEK PLAYING WELL: Mill Creek opens a three-game set on April 8 against No. 2 North Gwinnett in a series that should determine the Region 6-7A champion. Mill Creek took two of three from Mountain View last week, while North Gwinnett swept three games from Collins Hill. Mill Creek took a 2-1 victory over Mountain View on April 1 when Brendan York scored the winning run with two outs in the bottom of the seventh on a wild pitch. Mountain View defeated Mill Creek 10-9 on April 3 on Hunter Blackstone's walk-off RBI single in the bottom of the 10th. The Bears trailed 7-0 before scoring nine runs in the bottom of the sixth. But Mill Creek scored two in the seventh to force extra innings. Mill Creek pitcher Kyle Sterwerf allowed one run on six hits to earn the complete-game victory in a 3-1 win on April 4. Tim Simay led the Eagles at the plate, going 2-for-4. HERITAGE-CONYERS IN CONTROL: Heritage-Conyers coach Shane Ramsey knew his three-game series with Greenbrier in Region 3-6A play was big last week. He certainly didn't expect it to turn out like it did. The Patriots, last week's No. 4, swept a three-game series from the Wolfpack, previously ranked third in Class 6A. Pitchers Griffin Holcombe, Nick Watson-Garcia and Nolan Woodward combined to shut out Greenbrier and take control in the region standings. The trio combined to allow no runs, seven hits and 31 strikeouts in 23 innings. Neither allowed a Greenbrier runner to get past second base. The Rockdale Citizen's Colin Hubbard reported that 211 of Heritage's 311 pitches in the three games led to a combined 31 strikeouts. Watson-Garcia had 13 strikeouts in the first game of a doubleheader (a 2-0 win) on April 4. Holcombe and Woodward had nine strikeouts each in their victories. "Our guys knew what was at stake," Ramsey told the newspaper. ""Greenbrier) is really good. For them to come in and attack the zone like they did, I couldn't have asked for anything better. They set the tone. Each one of them, each game, set the tone." Ray Joseph scored the only run on a wild pitch in a 1-0, nine-inning victory on April 1 as Holcombe and Watson-Garcia combined on a one-hit shutout to outduel Greenbrier and UGA signee Bryce Melear. Joseph finished 2-for-4. Heritage took the first game of a doubleheader on April 4, 2-0, then Woodward hurled a four-hit shutout to help the Patriots in a 6-0 victory in the nightcap. Calabria Atkins went 2-for-4 with a double and RBI to lead the offense. EFFINGHAM COUNTY TAKES 2 OF 3: In a key three-game set in Region 2-6A, Effingham County took two of three from Richmond Hill. The Rebels took the first game, 3-2, on April 1 when Ryan Harley's RBI single scored Christian Campbell to break a 2-all tie in the top of the seventh. Harley then pitched a scoreless bottom of the seventh to earn the victory in relief of starter Ethan Johnson. Campbell and Harley finished with two hits each to lead the Effingham offense. But Richmond Hill's Jackson Finley allowed just one unearned run on three hits to lead the Wildcats to a 3-1 victory on April 3. Chase Brown led Richmond Hill at the plate, going 2-for-3 with a double and a RBI. Effingham took the rubber game by a 3-1 score on April 4. Garrett Brown outdueled Richmond Hill's Brandon Becker on the mound to help the Rebels win the series. Jerid Stokes went 3-for-4 with an RBI to lead the Rebels' offense. MARY PERSONS ON THE MOVE: Trippe Moore's two-run homer in the bottom of the 11th broke an 8-all tie to help Mary Persons stun West Laurens 10-8 on April 1 in the first game of a doubleheader. It helped set the tone for the Bulldogs in a three-game set, a series the Bulldogs took two games to one. Moore and Nate Howard each went 2-for-4 at the plate, while Camden Claxton finished 2-for-5. The Bulldogs then scored 17 runs on 18 hits to pound West Laurens 17-2 in three innings in the second game of the doubleheader on April 1. Eric Snow went 4-for-4 with a triple and four RBIs, while Claxton and Conner Watson added three hits apiece. However, West Laurens' Colton Scott hurled a complete-game three-hitter on April 3 to propel the Raiders to a 5-0 win. Brody Slaughter, A.J. Mathis and Paul Kellam led the Raiders with two hits each. PIKE COUNTY, JACKSON SPLIT: The much anticipated two-game series between Pike County and Jackson last week in Region 4-3A play produced a split, leaving the two teams tied atop the standings with just a few games left. On April 2, pitcher Coleman Crow allowed just two hits in five innings as Pike rolled to an 11-0 victory. Crow struck out 10 and got all the offensive support he needed when Marsh Burford smacked a three-run homer and Wyatt Lee went 2-for-2 with a double and two RBIs. But Jackson scored a 5-4 victory on April 5, using a four-run fifth inning to grab the lead for good. Dakota Copeland earned the victory in relief for Jackson, working 2 2/3 scoreless innings and striking out six. Brent Burford finished 2-for-3 with a double to pace Jackson's offense. Crow and Noah Windhorst finished with three hits each to lead Pike, who finished with nine hits. ROCKMART IN CONTROL: With two weeks left in the regular season, Rockmart took firm control of the Region 7-2A standings with two victories over Model, previously ranked seventh in Class 2A, last week. The Jackets won 9-5 on April 2 as Dylan Bailey and Brayden Cole each went 2-for-3 at the plate. Bailey finished with three RBIs, while Cole had two. Then Rockmart scored seven runs in the first inning to roll to a 12-1 victory on April 5. Bailey went 3-for-4 with a double, a homer and an RBI to pace Rockmart's 11-hit attack. Evan Ratcliff and Cooper Yanzetich each went 2-for-3. Yanzetich finished with three RBIs, while Ratcliff had two. CALVARY DAY UPENDS SAVANNAH CHRISTIAN: Calvary Day's Jay Wetherington allowed just one run on three hits as the Cavaliers handed Savannah Christian, the former No. 2 team in Class 1A Private, a 4-1 setback on April 2. It was the first loss in Region 3-1A play for the Raiders. Weatherington. Kaden Blankenship and Lance Longgrear had two hits each to lead the Calvary offense. The victory vaulted the Cavaliers into the Class 1A Private poll this week. IRWIN COUNTY PEAKING AT RIGHT TIME: After a slow start, Irwin County has won five straight and leads the Region 2-1A standings by a half-game over Clinch County. The two teams meet April 9 in Homerville in a key game that will impact the region standings. The Indians defeated Telfair County and Lanier County in region play last week. The 4-2 victory over Telfair County, the defending Class 1A Public state runner-up, on April 2 was big. Pitcher Brodie Chestnutt, a Florida State commit, struck out 10 and allowed two runs on three hits in 6 1/3 innings. Keegan Folker worked the final two outs for the save. Chestnutt's only blemish was a two-run homer from Telfair's Jonathan Rodgers. JOHNSON COUNTY BESTS SAVANNAH COUNTRY DAY: Johnson County continues to play well in Class 1A. The Trojans' Adam Hooks needed just 79 pitches to cut down Savannah Country Day 3-1 on April 5 in a key Region 3 contest. Hooks allowed just one run on four hits and struck out four to outduel SCD's Jarrett Karnibad. Hooks also went 2-for-3 at the plate with an RBI to lead the offense. Win Johns had two of Savannah Country Day's four hits off Hooks. 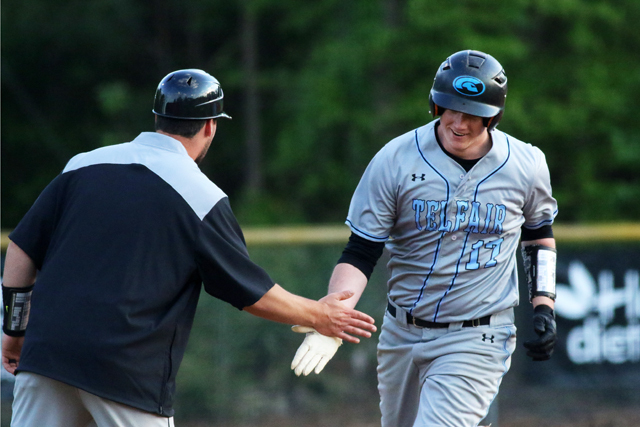 GORDON LEE TOPS TRION: Class 1A Public top-ranked Gordon Lee defeated Trion 11-0 in matchup of two of the top public school programs in Region 6-1A. Pitcher Jake Wright struck out 12 in five innings, while the Trojans erupted for 11 runs on 15 hits. JD Day and Justin Wooden each went 3-for-4 with three RBIs. Day had a double and a homer, while Wooden had a triple. Chris Potter, Garren Ramey and Wright finished the game with two hits each. ETC., ETC. : Starr's Mill, after losing many of its starters to graduation last season, is 21-2 on the season and defeated Denmark, Flowery Branch and Thomas County Central last week. The Panthers have won eight in a row. ... Blessed Trinity went 2-2 at the National High School Invitational last week in Cary, N.C. ... In Class 7A this week, No. 3 Hillgrove will meet No. 4 North Paulding in a key region three-game set. The winner should take over first-place in the Region 3-7A standings. There may no be a team playing better than Hillgrove. The Hawks are 20-4 after defeating Milton and Etowah last week in a pair of nonregion wins. Deion Walker went a combined 4-for-7 with a double, three RBIs, six runs scored and five stolen bases. Ethan Wright combined to go 3-for-7 with three RBIs and scored three runs. Wade Richardson combined to go 3-for-7 with two walks, two runs scored, two RBIs and two stolen bases. Parkview went 1-2 in South Florida last week. They lost to Venice (Fla.), 6-4, and Tampa Jesuit, 2-1. They defeated Sarasota 3-2. Offensively, Mauri Miller went a combined 4-for-9 with two RBIs, while Koby Ayala finished the week going 2-for-6 with an RBI. On the mound, Miles Garrett earned the victory against Sarasota. He allowed five hits and no earned runs in six innings. He struck out five. Xander Stephens got a no-decision in six innings against Tampa Jesuit. He allowed no earned runs on three hits and struck out five. Parkview is 20-4 on the season. Woodstock went 2-2 last week and took a week off from Region 4 play. The Wolverines defeated McEachern and Peachtree Ridge, but lost games late to Kell and Milton. Kameron Douglas combined to 6-for-9 with two doubles and three RBIs. Brennan Milone combined to go 6-for-10 with a double, a triple, a homer, six RBIs, three walks and was hit by pitches two times. Preston Gunnell went a combined 4-for-8 with six RBIs and five walks. On the mound, pitcher Josiah Siegel go a no-decision in a loss to Kell. In five innings. He allowed no runs on six hits and struck out seven. Woodstock is 15-9 on the season. Thomas County Central is 21-2 after defeating Colquitt County and Veterans last week. The Jackets lost to Starr's Mill on April 6. Shane Stephenson went a combined 5-for-9 at the plate to lead the offense. Pitcher Luke Benton earned his third victory of the season in a 12-1 victory over Colquitt County on April 3. Meanwhile, pitcher RJ Delaney earned his eighth victory of the season in a 3-2 win over Veterans on April 5. Westover went 2-1 last week with wins over Dougherty and Americus-Sumter. The Patriots lost to Columbus on April 5. La'Borris Buchanan batted .600 in the three games, scoring five runs and stealing nine bases. Kedarrius Cunningham batted a combined .700 during the week with six stolen bases, six RBIs and four runs scored. Cameron Hopkins combined to hit .556 with five stolen bases , six runs and seven RBIs. Damon Polite reached base in all nine of his plate appearances by either a hit or a walk. He combined to go 4-for-4 with five walks, six stolen bases and scored five runs. Cunningham threw six innings on the mound and allowed one run in an 11-1 victory over Americus-Sumter on April 4. He struck out nine. Westover is 7-14 on the season. Benedictine's Carter Holton struck out 17 and allowed one hit in a complete-game pitching performance in an 8-0 victory over Jenkins on April 3. in 40 2/3 innings this season, the sophomore is 6-0 and has allowed two runs (none earned), 11 hits and holds a 0.00 earned run average. He has fanned 96 and walked just eight batters. The Cadets are 16-7-1. In a three-game series against Cherokee Bluff in Region 7, Fannin County's Hunter Gray helped the Rebels take two of three. Gray was 7-for-10 at the plate with three doubles and three RBIs. Fannin County is 16-5 on the season. East Jackson handed top-ranked Jefferson its first loss of the season on April 4 in a 2-1 setback. Junior pitcher Josh Compton threw 6 1/3 innings, allowing a run on four hits. He struck out four. Compton also went 1-2 at the plate with a double and an a RBI. East Jackson is 10-10 on the season. In three victories over East Hall last week, Greater Atlanta Christian improved its season record to 10-9. Offensively, Harrison Stogner combined to go 8-for-11 with two doubles and 10 RBIs. Pirmin Brechbuhl went a combined 5-for-7 with two doubles, a homer and seven RBIs. Shane Lussier combined to go 5-for-8, scored seven runs and stole three bases. On the mound, Dawson Hamilton earned two victories in the three-game set. His line for the week was 6 2/3 innings, two hits, seven strikeouts and one earned run. Presley Field hurled 6 1/3 innings in an 8-4 victory on April 2. He allowed five hits, two earned runs and struck out five. Ringgold has won 12 straight including victories over Calhoun, Haralson County and Sonoraville last week. The trio of wins wouldn't have been possible without some strong pitching performances. In the 6-2 win over Calhoun on April 2, Holden Tucker struck out 12 and allowed just two hits in six innings. Johnny Camilluci allowed no earned runs in a 10-0 win over Sonoraville on April 5. Owen McWhorter allowed one earned run in four innings of a 2-1 victory over Haralson County on April 4. Wyatt Tennant, meanwhile, earned saves in games against Calhoun and Haralson County. Offensively, Andre Tarver combined to go 3-for-8 with two homers and four RBIs. Daulton Schley went a combined 3-for-9 with two homers and four RBIs. Sam Mills went a combined 3-for-8 with four RBIs. Tennant went 3-for-10 with a homer, while Tucker broke a 1-all tie with a solo homer in the victory over Haralson County. With a three-game sweep of Bryan County last week, Jeff Davis clinched a state playoff berth for the 18th consecutive season. Jeff Davis is 18-2 on the season and holds a 11-1 mark in Region 2-2A. Fellowship Christian is 16-5 this season and went 2-1 in the Diamond Dust Up Tournament last week. Senior shortstop Isaac Bouton, a Columbus State signee, combined to 6-for-8 with a double, two triples, a homer and 10 RBIs. He scored five runs and was hit by pitches four times. Sophomore infielder David Bishop went a combined 4-for-9 with a double, triple, an RBI, scored eight runs and stole four bases. First baseman/designated hitter Andrew Davidson combined to go 3-for-6 at the plate with a double, two RBIs and scored three runs. On the mound, junior Preston Joye earned the victory in a 13-3 win over Trinity Christian on April 4. He allowed four hits and struck out seven in five innings. In a 12-3 victory over Maynard Jackson on April 5, junior right-hander George Moraitakis struck out two batters in 4 2/3 innings. Saint Francis is 16-5 on the season after scoring four runs in the top of the eighth inning to beat Paulding County in a nonregion game on April 5. Freshman Carter Davies earned the victory in relief, allowing no runs and striking out five in six innings of work. Offensively, Kyle Bork, Brooks Mitchell, Bret Madren and Bennett Drake finished with two hits each. Bork finished with three RBIs, while Madren had two.